I am so tired of the enemy and his antics! He is ever at work trying to deceive God's people and the sad thing is...many of us are so busy that we don't even realize it! We need to remember that he has one agenda and one agenda only...to steal, kill and destroy God's people! He will lie, cheat, connive, steal, use trickery. You name it. Satan has no morals! He wants God's people to struggle! 1 Peter 5:8NIV tells us to "Be alert and of sober mind. Your enemy the devil prowls around like a roaring lion looking for someone to devour." Rest assured...if you are living for God loud and proud...the enemy is or will attack you. Put on your armor and be prepared to battle! Now, if your life is going as smoothly as a sea of glass, may I suggest that you to an inventory to make sure you are doing everything for the Lord that you can be doing! See, the enemy isn't as likely to attack if you aren't living full out for God. Oh, surprise! Satan doesn't care if you go to church! Nope! He just doesn't want you to really get into praise & worship or the message. He will keep you just uncomfortable enough to complain... It's when you begin to let the Word of God penetrate your heart that you will awaken the enemy! But we can fight! I've read the back of the Book and guess what...the enemy LOSES! God is victorious! Precious sister, read Ephesians 6. 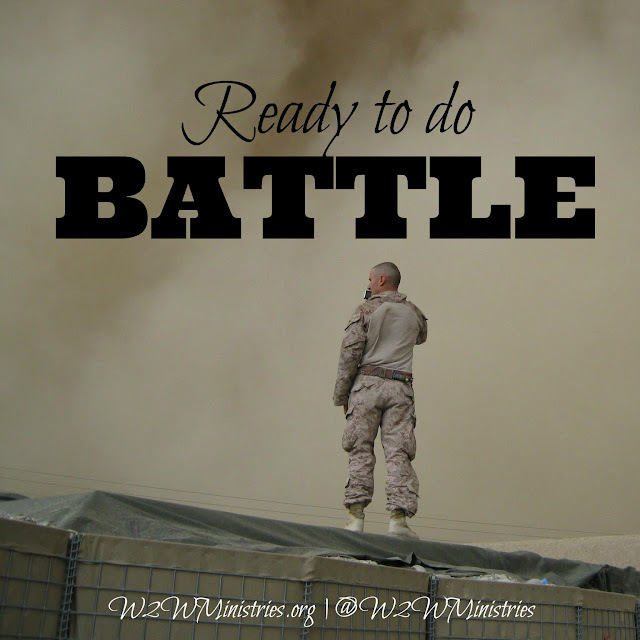 Put on the full armor of God and prepare yourself to do battle against the enemy. Kick him in the teeth and rebuke him! He has no place in the life of God's daughter! These trials and troubles brought on by the enemy are a reason for us to be joyful! "...when troubles of any kind come your way, consider it an opportunity for great joy. For you know that when your faith is tested, your endurance has a chance to grow. So let it grow, for when your endurance is fully developed, you will be perfect and complete, needing nothing." Have a wonderful day defeating the enemy!